Seamstar follows on from the Seamunit version; it enables higher production rates thanks to its continuous process. 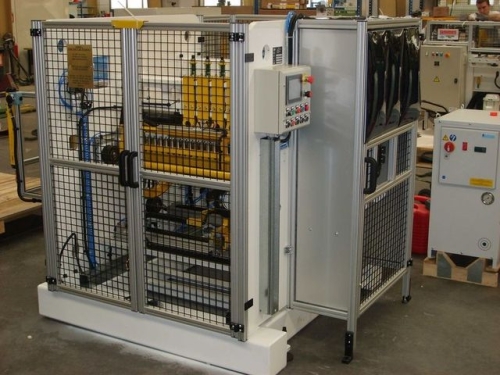 • Automatic cycle for positioning the edges to be welded, and for welding. • Shell diameter from 50 mm. • Shell length up to 2 metres. • Sheet thickness between 6/10 and 5 mm according to versions. • Productivity between 200 and 600 parts an hour according to models. • Possible shell forms: cylindrical, rectangular, oval, triangular, and any other complex form (to be validated according to the radii to be made). • Welding processes: MIG/MAG (mono and twin), TIG, Plasma, submerged arc, laser and hybrid laser. • In its basic version, Seamstar requires specific tooling per tube size, but with the Flex- option no tooling is required. • In addition to our standard range, we examine every request to adapt our machines to the specifications of our customers. • Version without specific tooling – Flex-Seamstar: the welding cage is digitized and enables very fast production change times, less than a minute. A very wide production size range is possible. • Integration in a rolling station. • Pump and compressor bodies. • Various tubes for all industries.